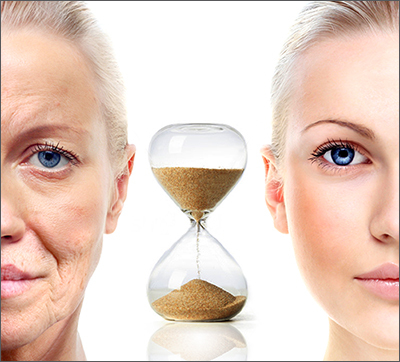 The number one cause of external skin ageing is created by the sun’s ultra violet rays. Although Australia has recently introduced SPF50 sunscreens, these still only provide 98% protection against radiation and unless they are re-applied regularly throughout the day, the skin is still vulnerable to premature damage, wrinkles and age spots. Whilst hiding in a dark cave may be the only guaranteed solution to avoid ageing rays, it is essential to up your summer skin protection plan by wearing a wide-brimmed hat and sunglasses when in direct sunlight. Ageing of course affects more than just the face with the neck, chest and backs of the hands showing the first signs of damage. Always ensure these areas plus any exposed limbs are also covered in sunscreen and further protected with light clothing and breathable fabrics like cotton or linen. Whilst the sun may be the skin’s worst external enemy, the old adage ‘you are what you eat’ has never been truer when it comes to internal triggers that accelerate skin ageing. The number one cause of systemic skin breakdown is known as glycation and often remains a silent attacker zapping the skin of youthful volume and firmness. Glycation is technically defined as the bonding of a protein molecule with a sugar molecule. As the sugar binds, it starts to breakdown protein integrity and structure creating often irreversible damage and accelerated signs of ageing. Collagen, the substance that gives our skin composition, form and volume, happens to be the most abundant protein found in the human body. When sugar attacks collagen proteins, not only does the skin lose density and tone, characteristic ‘criss-cross’ wrinkles form appearing like a quilted pattern. These signs of glycation are most prevalent around the crow’s feet, chin, neck and back of the hands areas. Whilst a sunscreen and appropriate clothing will provide skin protection from the outside in, how can one slow down the onset of glycation? Processed sugars and high GI foods are the biggest culprits including soft drinks, sweets and many alcoholic beverages. Whilst sugar is often attributed to so-called ‘bad foods’, don’t forget that many fruit juices and high-carbohydrate foods like pasta and white bread can be just as sugary as a soft drink. As with everything in life, balance is key – look to wholegrain and unprocessed foods for a healthier skin choice. Have sugar in your coffee? Why not consider switching to a natural, sugar-free sweetener such as stevia.